Denna Laing, a young woman whose courage, grace, selfless attitude and positive outlook in the wake of devastating circumstances serve as an inspiration to everyone she meets, and Dov Weinryb Grohsgal, whose calm demeanor, compassion and fierce loyalty have enabled literally hundreds of Princeton athletes to have their best possible undergraduate experience, were honored with major awards at the Gary Walters ’67 Princeton Varsity Club Awards Banquet on May 31st. Laing received the Class of 1967 PVC Citizen-Athlete Award, presented by the PVC for selfless and noble contributions to sport and society. Click here to view Denna’s speech. 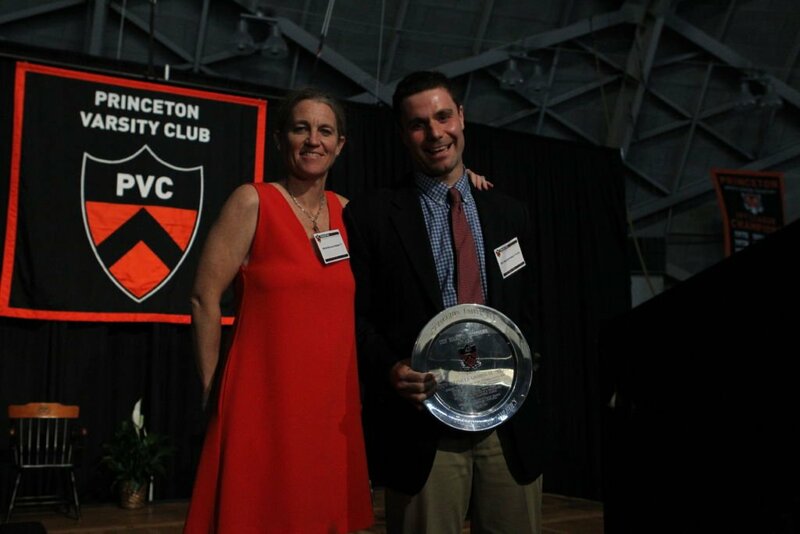 Grohsgal was the winner of the Marvin Bressler Award, given to that member of the Princeton family who, through heartfelt support of the University’s student-athletes and coaches, best embodies a belief in the lifelong lessons taught by competition and athletics as a complement to the overall educational mission in the spirit of Marvin Bressler, a Princeton professor of sociology from 1963-94. Click here to view Dov’s speech. Click here to view complete speeches for both alumni award honorees. 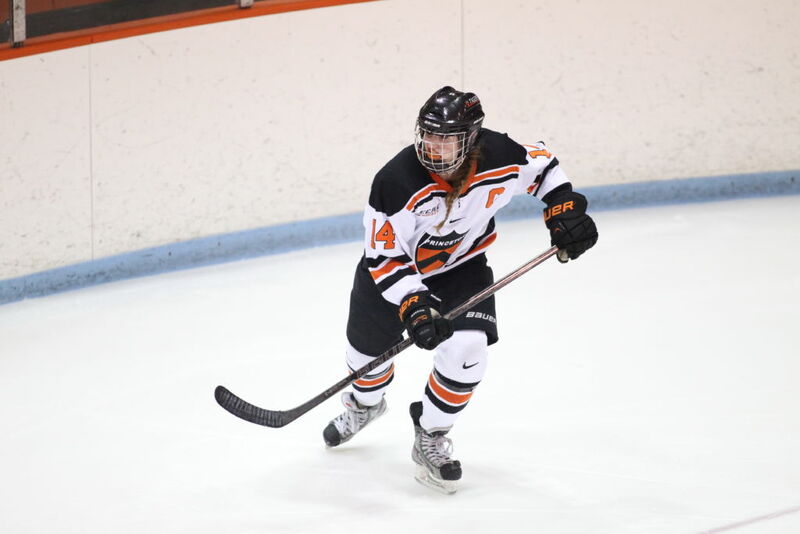 A 2014 Princeton graduate, Denna Laing was thrown into a literal fight for her life when she suffered a catastrophic spinal cord injury in the inaugural Women’s Winter Classic professional women’s hockey game on New Year’s Eve 2015. Since then, her body, but not her spirit, has been confined to a wheelchair. Despite her challenging prognosis, Laing has approached her own rehab like she approached her opponents on the ice, with tenacity, grit and resilience, as she continues to work towards one day walking again. In the meantime, she also has refused to give up her active lifestyle and has devoted her time to helping others who suffer from spinal cord injuries. Laing completed the 2017 Boston Marathon, pushed in her chair for the entire 26.2 miles by former NHL player Bobby Carpenter, in slightly more than 4.5 hours, and in doing so raised more than $80,000 for Journey Forward, an exercise-based institution for spinal cord injury patients. She has also become involved in rowing, along with her daily rehabilitation program at Journey Forward. Prior to her injury, Laing worked as a victim and witness advocate in the Essex County District Attorney’s office, and she hopes to one day attend law school. 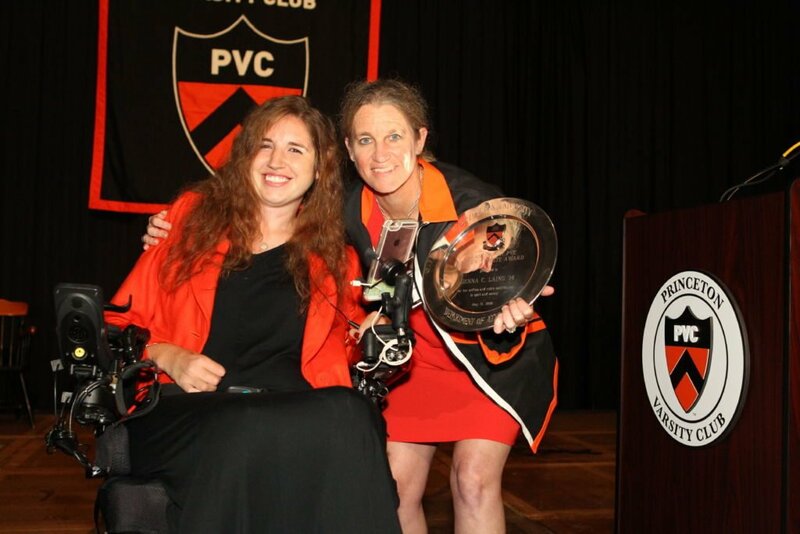 Currently, Laing serves as an ambassador for the Christopher and Dana Reeve Foundation, where she mentors and advocates for others with spinal cord injuries and is a tireless supporter for and inspiration to others who are facing the same obstacles as she. In 2016, she was honored by the organization with the Dana Reeve Hope Award. A politics major at Princeton, she was a Student-Athlete Wellness Leader, an ECAC All-Academic team member and a second-team All-Ivy League selection. She helped the Boston Blades of the Canadian Women’s Hockey League to the league championship in 2015 and then was playing with the Boston Pride of the National Women’s Hockey League at the time of her injury. Her unwavering resilience and inspiring attitude have not gone unnoticed, and she has been honored by the NWHL, Journey Forward, the NHL, the Boston Bruins and the Boston Red Sox (Opening Day 2016, Denna Day at Frozen Fenway 2017). Dov Weinryb Grohsgal’s contributions cannot be remotely measured by his actual job description. Instead, Princeton’s athletes know him as someone who has had their backs at all times, and they also know that with him they’ve had someone to reach out to day or night for advice and guidance. The list of students he has helped is enormous, all while maintaining his easy-going personality and strong sense of humor. From 2015 until February 2018, he served as Associate Dean in the Office of the Dean of the College, where his primary responsibilities included advising student-athletes, overseeing the Academic-Athletic Fellows Program and managing the Freshman Seminars Program. As Associate Dean, he provided guidance to students, faculty members and others regarding a variety of matters affecting the academic lives of Princeton undergraduates and helped to manage the relationship between academic and athletic affairs. His primary responsibilities included: overseeing the work of the Princeton Academic-Athletic Fellows Program, collaborating with the Office of the Dean of the College to shape the advising role of fellows, helping to enhance the advising experiences of student-athletes, working with Athletics and the Registrar’s office on matters pertaining to student-athlete eligibility, contributing to the larger program for advising undergraduate students and supporting other Dean of the College initiatives related to undergraduate education. Grohsgal received his doctorate in history from Princeton in 2013, and he has taught in a variety of academic units, including the Department of History, the Woodrow Wilson School, the Freshman Scholars Institute and the Princeton Writing Program (where he received the Quin Morton ’36 Teaching Award). His research focuses on school desegregation and civil rights in the 1960s and 1970s, the Nixon administration and the history of poverty. His first book is under contract with the University of North Carolina Press and is due out in 2019. Its working title is “Bring Us Together”: The Politics and Policies of School Desegregation in the Nixon White House and is an examination of school desegregation and busing in the early 1970s as a top-down civil rights history and a bottom-up story of political activism and compromise. His current title is Associate Research Scholar and Lecturer in the Department of History and the Woodrow Wilson School of Public and International Affairs at Princeton University. In that capacity, he teaches courses at the Woodrow Wilson School and in the History Department – including courses on methods in policy research and approaches to historical analysis – and advises independent work. He is also working on a number of interdisciplinary research projects at the intersection of history, public policy and the social sciences, and the digital humanities. In addition he serves as an Academic-Athletic Fellow for multiple Princeton athletic teams, helping to manage the relationship between academic and athletic affairs. He is an honorary member of the Class of 2014, a fellow at Mathey College, and a faculty adviser in Wilson College. A Phi Beta Kappa graduate of Emory University, Grohsgal majored in history and economics and was a two-time captain of the crew team.